Prepare the ice ball molds by spraying lightly with cooking spray and then wiping clean with a paper towel. (This will leave a slight residue, which will assist in unmolding without affecting the taste or appearance of the jello shots.) Close molds so they are sealed tightly, leaving the top plug open. Set molds on a tray for easy transport to the refrigerator after filling. Pour tonic water into a small saucepan, and sprinkle with gelatin. Allow to soak for a minute or two. Heat over low, stirring constantly, until the gelatin is completely dissolved. Add sugar and stir until sugar is dissolved (another minute or so). Remove from heat and stir in the vodka. Using a meat injector (with the needle removed), divide the liquid between the molds, leaving a small air pocket at the top (which will later be filled with the gel icing for the iris and pupil). When all are filled, replace the plugs on top so the molds are airtight. Refrigerate 3 hours or overnight, until solid. Carefully remove gelatin balls from molds and place on a deviled egg tray (or appetizer tray with indents) to hold them upright with the air-pocket. Using the green or blue gel icing, fill the shallow hole on top to create the iris of the eye. Using the black icing, create a pupil in the center of the colored gel. Even creepier: Use red gel icing to create a bloodshot-eye look by making squiggles from the iris down the sides of the eyeball, if desired. 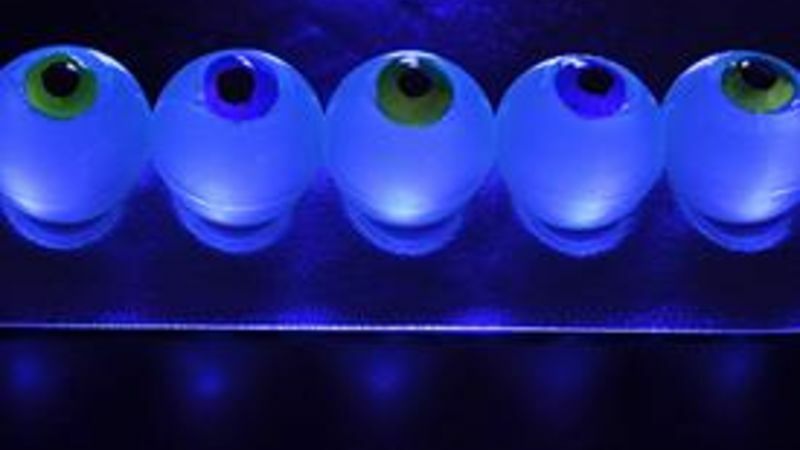 Showcase your eyeballs under a black light to make them glow eerily. Even without the black light, they're plenty creepy, though! The tonic water is a crucial ingredient if you want your eyeballs to glow under black light. If you don't plan to use a black light, however, the tonic water can be substituted for clear juice for more flavor. If you don't have a deviled egg tray to display your eyeballs, use the bottom half of an egg carton. The eyeballs must remain UPRIGHT, or the gel icing will slip out of the socket. Eeew! These are larger than typical jello shots, so reduce the vodka and increase the tonic water and sugar, if desired. Another option is to use rounded ice cube molds to make smaller eyeballs. Substitute clear juice (like white grape juice) for the vodka to make these kid-friendly. It’s Halloween and you need an eeewy hit for your creepy party. Well, gory ones, give these the evil eye: Glow-in-the-Dark Eyeball Jelly Shots! Ever since my nephew learned to do the evil eye when he was about a year old, strange looks like that give me the creeps. Picture it – a cute cuddly babe in a high chair, all grins and giggles. But on command (“Do the evil eye!”), he morphs in a nanosecond and stares you down with one ghoulish eyeball literally popping out of its socket and the other shaded by a furrowed brow. This literally melted a room of normally normal and rather reserved adults into a hot mess of laughing idiots. Sadistic, I know. But in the spirit of Happy Halloween partiers, sans the baby entertainer, we found this idea on the ‘net and gave it a spooky spin with a black light and some vodka. These Glow-in-the-Dark Eyeball Jelly Shots are evil looking, alright. Seriously creepy peepies. But they’re a ridiculously easy way to blast that blah bash into a straight up monster mash. Step 2: Spray the insides of the molds lightly with cooking spray, then wipe them out with paper towels to leave just a slight film behind. This will make sure your eyeballs pop outta the molds later. Step 3: Sprinkle gelatin over tonic water in a pan and let it hang out there a couple minutes. Then turn the heat on low and stir to dissolve the gelatin. Step 4: Add a bit o' sugah and stir 'til it's dissolved. Then remove the pan from the heat and add the vodka. Yes, vodka. Notice there's no picture of that. Don't ask why. Step 5: Get yerself one-a these meat injector thingies for this part. They're cheap. Look by the turkey supplies at the store. This makes filling up these little spheres SO. MUCH. EZ. ER. Step 6: Line-em-up-n-fill-em-up. Eyeball assembly line. Yop. Step 7: Notice that little air pocket at the top. That will become the iris of the eyeball later. I know. Eeew. Step 8: Don't forget to plug the holes! Then put 'em all in the fridge for a few hours while you give your own eyeballs a rest. Step 9: Carefully remove the eyeballs from their molds. Now it's the eeewy gooey part. Use green or blue gel icing to fill in the hole at the top to make the iris of the eye. Step 10: Use black gel icing to make a large black dot in the center of the colored gel for the pupil of the eye. THIS is why I am not an optometrist. Step 11: I had to hold a cow's eye in my hands in junior high science class once. Yah, it was something like this. Step 12: Get in a little eyeball line, you little eyeballs, you! Here's what they look like when you're done. Step 13: Now hook up an el-cheapo black light to shine on those ogre eyes, then dim the lights. WHY? Because, Halloweenie, the tonic water in the jelly shots GLOOOOOWS under black light! No, really...it does! Step 14: Vodka ogre eyeballs. This will be a bash to remembah! Even more ghastly: Add red-icing for a bloodshot eyeball look. Make ‘em for the Kiddos? Sure! You can make these for a kid party, too. But, paaaleeeze omit the vodka and replace it with white grape juice. And maybe forget about the bloodshot thing too, unless you’ve got teens in the house -- then go ahead – make their day.